Father David Osbourne is the Parish priest of Cranleigh and Bramley. This Lent he’s cutting out petrol and will be donating all of the money saved to the CAFOD Lent Appeal. 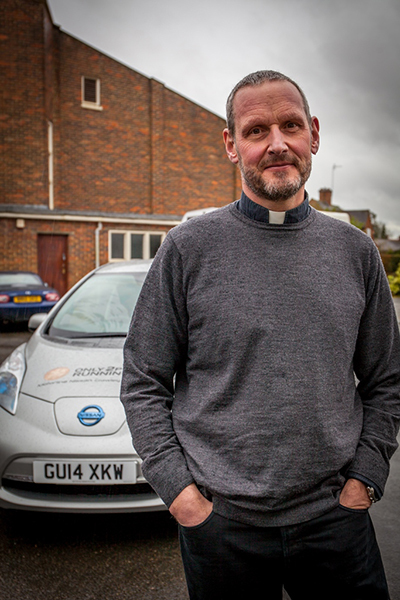 The help complete his petrol-free Lent challenge, Crawley Nissan have allowed him to borrow a new Nissan Leaf car. For me, this Lent, ‘Cut it Out!’ means trying to cut out some use of fossil fuels used in motoring and thus call attention to alternative power sources and uses. This may highlight our almost total dependence on fossil fuels which are not only irreplaceable but are contributing to the largest contemporary threat to civilization – global warming. I have been loaned an electric car by Nissan to experience whether battery powered vehicles are an alternative not only for the “keenies” but a viable alternative for mass transport. I’m not sure that’s possible either!